Exhilarating outdoor recreation, beautiful scenery and curious wildlife await those interested in lake country wintertime fun. Our area offers miles of groomed skiing trails that offer something for all ages and abilities. The beginner as well as the advanced skier will enjoy the scenic beauty of the Longville area backcountry. 10 miles west of Pine River in the Foot Hills State Forest. The trails are rated from novice to expert. 5 miles west of Longville on County Rd 5. Novice to intermediate 15 km of trails across gently rolling hills around wetlands. All trails are rated Easy. Ski pass is required. 8.5 miles northwest of Hackensack on County Rd 6. 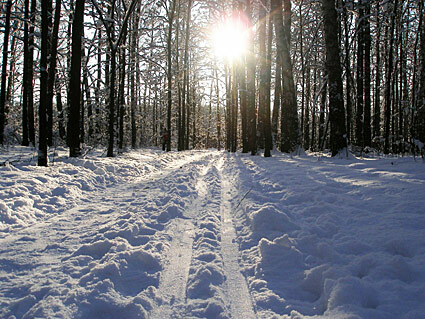 One of Cass County’s most popular ski trails offers 8 km of Expert trails. No toilet facilities. Ski pass required. 6 miles south of Walker on MN Hwy 34 (20 miles west of Longville) 10 km of groomed ski trails from novice to expert along the slopes of the Shingobee River Valley. 3 km groomed for skate-style skiing. This trail provides access to a network of ungroomed trails along the Shingobee River and to the North Country National Scenic Trail for the truly adventurous. 2 miles north of Outing on MN Hwy 6. Diverse lake and woodland trails in the Land O’Lakes State Forest – (17 miles east of Longville) near Outing. Offers 23 km of expert trails, 10 km of additional trails and spectacular scenery. Ski pass required.